Happy Taco Tuesday and Meatless Monday rolled into one! Ok, so I don’t normally name every day of the week after a food theme but Taco Tuesdays are my favorite! We’ve got a couple of restaurants around Park City that offer $2 tacos and cheap margaritas in the summer. But I like tacos and margaritas all year round (especially margaritas)! I have also been more conscious about trying to eat healthier, whole foods and more vegetarian foods when possible. Monday’s are the perfect day of the week to eat a healthy meatless meal…I usually don’t eat very well over the weekend and I always take advantage of apres drinks after skiing! 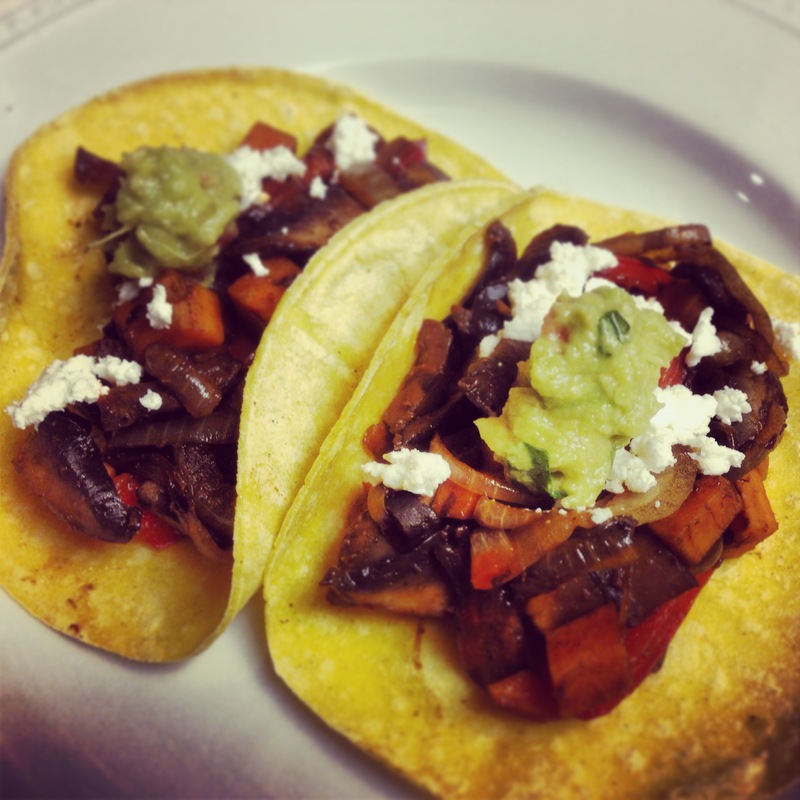 Regardless of your eating habits, these portobello mushroom tacos are delicious any day of the week! Enjoy from SBITK! In a large skillet, heat 1 tablespoon of olive oil over medium-high heat. Saute sliced onion, pepper and mushrooms until golden brown and tender, about 6-8 minutes. To serve, place a few spoonfuls of mushroom saute onto corn tortillas top with goat cheese, cilantro and other desired toppings. This entry was posted in Entrees, Recipes and tagged meatless monday, Portobello Mushroom tacos, sweet potato mushroom tacos, taco tuesday by skibootsinthekitchen. Bookmark the permalink.